Upcoming Shows - EmpeROAR Fabulous!!! Is THIS happy when you come to his shows! Here's where you can catch him soon! The easiest way to stay up to date with upcoming shows is to join E. Fab's mailing list. Scroll past this form to see upcoming show listings. Duh, because I love you! I want to know what's going on know about ticket giveaways! I am already on it, but I just love pressing buttons on your stupid forms so I had to do it again! No, and I don't want to be. Leave me alone. Get off my lawn. Art is stupid. SHHHHHHHH!!!!!!! I'm a secret performance! But if you're enough of a fan to be trolling my website, I want you there! Miss Kitty Baby, Faggady Randy, Burt Rug Reynolds, Ade, Amy Whinehouse, Nelson Heston Riley & ...pst.... its also Nelsons Birthday! The Classic 70s fill-in-the-blank TV game show "Match Game" and its Dynamite host Gene Rayburn get a few new twists in MATCH GAME Re bar an exciting, fast-paced, live, interactive, reinvention of the bawdy classic. Watch as 4 contestants per show will be pulled directly from the audience to try to win fabulously funny prizes by matching wits with local celebrity guest stars. Award winning cabaret and burlesque performer EmpeROAR Fabulous!!! 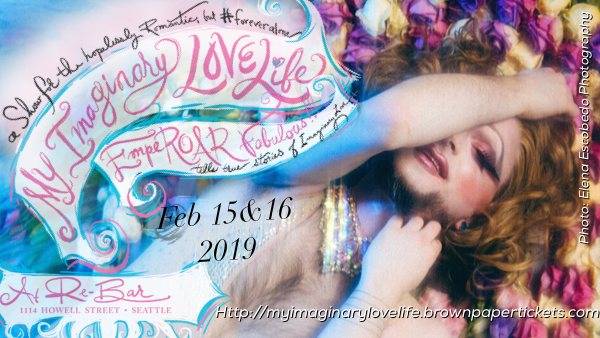 tells the 100% true tales of his 100% Imagined Love Life through song, dance, burlesque, and multimedia shenanigans. A show for the hopelessly romantic, but #foreveralone, this show offers single romantics an alternative to anti-valentines day cynicism. Couples are welcome too, I guess. This show promises a child-like sense of wonder through musical production numbers, costume pieces that become set pieces and vice versa, pop up books, mobiles, acrobatics, and more ridiculous surprises that support this sweet tale of hope. Tongue in cheek, heart on sleeve. Got no love life? Just make believe! Written by, starring, and featuring original music and arrangements by EmpeROAR Fabulous!!! What the press are saying about EmpeROAR Fabulous!!! The Violet Crown Follies is an ongoing burlesque residency, every month featuring live music, comedy, drag, variety, and world-class burlesque performances in a swanky cabaret setting. The Jigglewatts Burlesque Revue is excited to play in this jewel-box of a theatre, where floor to ceiling red velvet curtains, an artfully appointed stage, and an aura of old Vaudeville add to the immersive experience. Guests can also look forward to saucy door prizes and goodie bags from Forbidden Fruit boutique.